Space Shuttle Program (SSP) managers have completed their Delta Flight Readiness Review (FRR) with a decision to press on to the primary Agency FRR next Friday. The expected decision came after managers reviewed the current flight rationale for External Tank (ET-137) following its modifications, although Discovery’s pad rats are having to work through numerous issues out at Pad 39A. The Delta SSP FRR was mainly an update of the baseline SSP FRR – which was conducted on October 6 – whilst focusing on the work carried out on ET-137 via modifications to the stringers, an impressive effort to mitigate the potential of cracks forming on the intertank support beams. 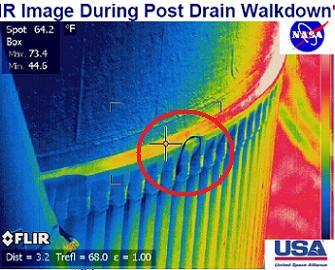 The problems with the stringers were first noticed via a large U-shaped crack on the LO2/Intertank flange foam via Infra-red cameras at the pad during the draining of ET-137 – after STS-133’s launch countdown was scrubbed due to a leak from the tank’s Ground Umbilical Carrier Plate (GUCP). That launch date won’t be officially set until the Agency Delta FRR next week, pending the successful launch of the Ariane 5 ECA carrying ATV-2 on the opening launch attempt. From a flight rationale standpoint, the superb multi-center effort into the root cause evaluations – and resulting modification involving radius block installation on the tank’s stringers – has resulted in a large amount of confidence the tank won’t suffer from additional cracks, either during the tanking or – more importantly – the ascent uphill, avoiding the main concern of foam liberations and the overall integrity of the tank during flight. 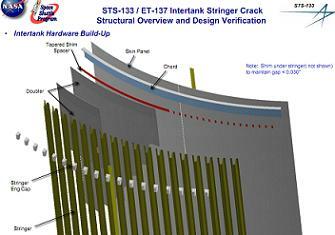 “The modifications to ET-137’s LO2 stringer ends and the associated TPS (Thermal Protection System) work is complete. The test matrix to support flight rationale for the ET stringer modifications continues to be executed, with a scheduled completion date of February 11th,” noted pre-FRR notes (L2). Only one area of flight rationale remained in work heading into the review, relating to test matrix work on stresses on one area of the stringers – work which was expected to be completed on Friday. It is not clear if the test matrix was available in time for the Delta SSP FRR review, or if it will be signed off at the Agency FRR – given the SSP review was due to take place on Thursday, prior to a one day delay, with review documentation already created earlier this week. “A brief status of the work being performed in support of flight rationale was provided. One of the key elements of this flight rationale is ensuring the modification does no harm,” added the notes. Other updates, which will play a role in the considerations of managers at the Agency Delta FRR, includes the status of the International Space Station (ISS), ranging from the failure of the Water Processing Assembly (WPA) on Station – which would have led to debate over water supplies during STS-133 – prior to its speedy recovery the next day. Despite the return of new Interim Problem Reports (IPRs) into Discovery’s pad flow since her return to Pad 39A, processing remains on track for the February 24 launch date, with several days of contingency remaining in the schedule. Discovery has been put through S5009 Ordnance Installation tasks, alongside orbiter closeouts on her aft section and the scheduled move towards preparations for S0007 Launch Countdown operations. “S5009 Ordnance Installation/Connection: Call to stations was completed Thursday afternoon at 1400 EST. SRSS open loop test, flight code load, and interface test are complete. Ordnance installation and connections are complete,” noted the latest NASA Test Director (NTD) report (L2). Numerous new IPRs have been charged to Discovery’s pad flow over the past two days, most of which have either been cleared as a constraint to the flow or are in the process of being cleared. The IPRs range from an Inadvertent Switch Throw on a circuit breaker, to a LO2 temperature transducer showing off-scale low, when should be off-scale high, on the orbiter’s Main Propulsion System (MPS). On the latter issue with the Engine 3 LO2 temperature transducer, troubleshooting revealed that “dropouts occurred when a wire at the backshell was wiggled. Dropouts also occurred when spot ties and tape was removed,” according to the NTD report, which confirmed the harness segment will be removed and replaced when time in the flow allows. On the latest issues reported on Friday, IPR-89 and 90 – the latter of which was related to a problem during the SRB (Solid Rocket Booster) recovery system test, not unlike the issue during STS-129’s pad flow, will both be closed. The main item of interest continues to be with the GUCP, which produced at least one small leak during testing once it was connected to the tank. 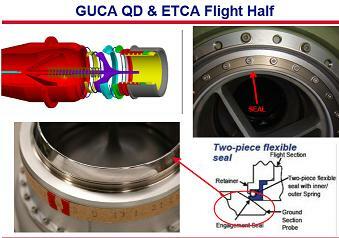 This resulted in managers calling for the system to be disassembled to allow for the changeout of its two part flight seal on the Quick Disconnect (QD). However, once the GUCP was reinstalled to the tank, another problem was noted when the right hand pivot assembly – a key part of the system, given its relation to the GUCP’s alignment – showed a small amount of movement. Because any threat of misalignments in the GUCP system can lead to leaks during tanking, managers are discussing if any further work that may be required to aid confidence in the system. 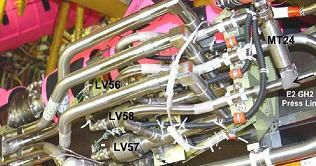 “The flight seal was removed and replaced and flight seal torques are complete. 7” QD installation is complete. Ventline raising/mate, GUCP alignment measurements, draw weight lowering, and GUCP electrical connects were completed,” noted the NTD report. “However, a small movement in the right hand pivot assembly was measured after vent line connect and prior to withdrawal weight and the pivot pin became loose. After some discussion it was decided to proceed with withdrawal weight operations. Good news has been reported since the re-installation, with leak checks on the system passing without issue. This should lead to a nominal tanking later this month, especially after the mitigation approach of “clocking” the carrier plate after the GUCP leaked during the November launch countdown. 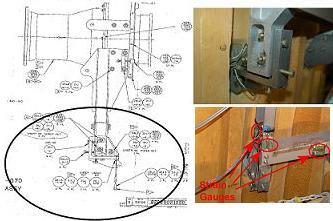 An update will be published, should the investigation team decide to take action on the pivot assembly. Another new item of interest was also noted on Friday, relating to loose fasteners being observed on Atlantis’ Space Shuttle Main Engine (SSME) dome heat shields, leading to borescope inspections being carried out on sister Discovery out at the pad. Engineers did find some minor discrepancies with Discovery’s hardware during the inspection, which is currently under review. Other issues in Discovery’s eventful pad flow of late are being closed, as the NTD updated the status of several items of interest, ranging from the Feeler Gauge – which fell apart as an engineer was working on the GUCP work, sending numerous blades down the stack, one of which caught the External Tank – to the loud noise heard by engineers during the hyperloading tasks on Discovery’s SRBs. IPRs and items of interest during this stage of the pad flow are common and are usually cleared without any impact to the schedule, thanks to the highly experienced engineers who care for the shuttles. 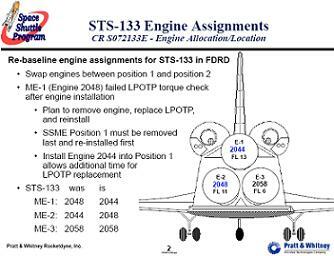 None of the issues reported above have even impacted the contingency days in the STS-133 schedule towards launch. (Further updates and articles will follow. Refer to live coverage threads linked above. L2 members refer to STS-133 live coverage sections for internal coverage, presentations, images and and updates from engineers and managers. Images used, Larry Sullivan MaxQ Entertainment/NASASpaceflight.com and via L2 acquired PRCB presentations).